Apple iPod Classic 6th Generation Black 80GB - New Battery Good Condition! IPod has passed a high-standard comprehensive test which covers all aspects of the iPod's functionality. iPod is fully functional. 4.5 out of 5 stars - Apple iPod Classic 6th Generation Black 80GB - New Battery Good Condition! 791 product ratings791 product ratings - Apple iPod Classic 6th Generation Black 80GB - New Battery Good Condition! Trending at $97.31eBay determines this price through a machine learned model of the product's sale prices within the last 90 days. IPod classic 5th Generation. 1 X Black ipod classic video ( 80GB ). 1 X Changer. Storage Capacity. Audio / Video Capabilities. Audio Supported Formats. Max Video Resolution. Product Identifiers. Apple iPod Classic 6th Generation Black Gray 80GB - New Battery Works Great! IPod is in g reatoverall condition and fully functional! Typical scratches around body from normal use. iPod is 80gb storage silver color. iPod only, no cables. Trending at $102.49eBay determines this price through a machine learned model of the product's sale prices within the last 90 days. Apple iPod Classic 6th Generation - MB029LL/A - A1238 - 80GB - Silver - Used. Condition is Used. Works great! iPod only. No charger or instructions/packaging included. Shipped with USPS First Class Package. Check out my other auctions! I combine shipping. Message me with questions! CUSTOM SKELETON CLEAR CASE FRONT 80GB IPOD 5.5 GENERATION MODEL MA450LL. IT HAS A NEW CLEAR FRONT, NEW BACK AND NEW BATTERY. THE HARD DRIVE IS PRISTINE WITH 0 REALLOCS AND 0 SECTORS. LIFE IS BETTER WITH AN IPOD ! iPod is in used cosmetic condition with normal to heavier signs of cosmetic wear throughout the device. The unit will contain heavy scratches, and scuff marks/dings, especially on the back of the unit! The device is free of any cracks/chips (for units with LCD screens). The unit may have a personal engraving on it! Device is in 100% working condition, fully functional. APPLE Limited warranty has expired. This listing includes the iPod, and generic USB data sync cable. Photos are for generic purposes only and are not the actual device you will receive. Reformatted with a Mac. May not be recognized by Windows 10!. Apple Subfamily: iPod classic Apple Model No: A1238 (EMC 2173). Also see: All iPods with the A1238 Model Number and the 2173 EMC Number. Either model can hold "up to" 25,000 photos. Onboard RAM: 64 MB Storage Capacity: 80 GB, 160 GB. Operational Condition : Good Working. Display Condition: Good. Apple iPod Video Classic 5th Generation White 60GB - New Battery + Wolfson DAC! IPod has passed a high-standard comprehensive test which covers all aspects of the iPod's functionality. iPod is in good condition as seen in the pictures! New battery installed and works great! 4.5 out of 5 stars - Apple iPod Video Classic 5th Generation White 60GB - New Battery + Wolfson DAC! 145 product ratings145 product ratings - Apple iPod Video Classic 5th Generation White 60GB - New Battery + Wolfson DAC! T his is for the iPod, and a charging cable. The iPod is in perfect working condition. The iPod shows typical signs of use and you can only see about half the screen due to a cracked LCD. Version 1.3. S/N 8k644d4fv9p. Model MA448LL. Windows format. Tested this item out and works fine. Apple iPod Video 5th Generation Black (60 GB). Perfect Working Condition. Apple iPod Video 5th Generation Black (60 GB). Perfect Working Condition. Condition is Used. Condition is Used. I t sh ou ld. Th is doesn’t ef fe ct t he iPod at a ll. 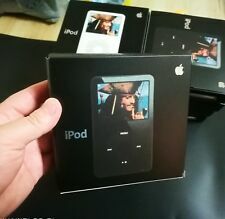 iPodi s 60gb storage a nd b la ck i n Colo r. iPod only, no cables. Apple iPod 5th Generation Classic 60GB Video A1136 MA147LL - Works Great! Condition is Used. iPod i s f u l l y functional a n d w o r k s l i k e.
Apple iPod classic 5th Generation Black (80 GB). Condition is Used. Shipped with USPS First Class Package. In excellent condition and comes with charger cable and case included. Condition is Used. The iPod has been reset to factory defaults and is ready to go. It is Factory reset. Good condition. Some scratches. Apple iPod classic 6th Generation Silver (80 GB). Condition is Used. Shipped with USPS First Class Package. IPod classic ("Original"/6th Gen) None. 6TH GENERATION -SILVER COLOR. Storage 80 GB, 160 GB Optical None. Complete iPod classic ("Original"/6th Gen) Specs. IPOD CLASSIC. Family iPod classic ID None. RAM 64 MB VRAM None. Replaced rear caseback from 160GB model, this iPod is an 80GB HDD model. Corner dents were filed out and colored in with black marker. Trending at $88.98eBay determines this price through a machine learned model of the product's sale prices within the last 90 days. Apple iPod classic 6th Generation Silver (80 GB). Condition is Used. Shipped with USPS First Class Package. Has the basic scuffs on the back from being used but always handled with care, comes with cord, all bits work properly. Selling iPod 80 gb classic 5th generation. The iPod can be finicky with iTunes. Does not come with accessories but fast shipping! Apple iPod classic 6th Generation Black (80 GB). Condition is Used. Shipped with USPS First Class Package. Apple Ipod Classic Video 5th Gen (A1136) 80gb Black Tested Working 13,420 Songs. Condition is Used. The screen has cracked and very slight pixel damage (please see screen picture). Comes with apple new earbuds and the aftermarket charger. Shipped with USPS First Class Package. Apple iPod classic 80GB 6th Generation Main Logic Motherboard ( Model 820-2168A) - Genuine, Used. 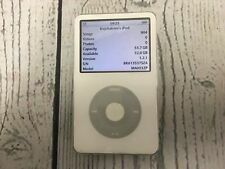 Apple iPod classic 5th Generation White (60 GB). Condition is Used. Shipped with USPS Priority. Works fine but in the process of moving and can’t find old style charger. Apple iPod Classic 6th Generation (80GB) Silver 30 day warranty MB029LL !!!!!!! IPod Classic 6th Gen 80 GB Silver Near mint condition. This ipod is factory reset and ready for your itunes. Trending at $68.33eBay determines this price through a machine learned model of the product's sale prices within the last 90 days. Refurbished iPod in Good condition. The item doesn't include original box. USB Charging Cable.